I’m caught in a vicious cycle. I like to work and I’m good at it. I feel valuable from being productive. I enjoy the accolades and approving nods that follow great accomplishment. I want to give You my best, Jesus! I will gladly do whatever You ask of me, though it cost me money, sleep, time and even push me well beyond my limitations. Therefore, I work and I cannot stop. But, here I am, finding myself depleted, exhausted. Should the approving nods become condescending silence, my soul is bruised. Though I long for Your approving embrace, Father, how can I possibly measure up? A daughter of God should never become exhausted in His service; I shouldn’t be so tired! I’m sorry I’m so weak, Lord! Shouldn’t a daughter of the King be continually refreshed? Why don’t I hear Your voice? forever hopeful and abounding in joy? Why am I forever depleted, driven by an unseen task master? Why am I always chasing the mirage of approval? Whatever I do, it’s never enough. My work, my striving for excellence, none of it feels like enough. I work to prove my worth. More work equals more worth; more productivity equals more value. Is this Your design, Jesus? Your Word says no, but how can I be free? I long to break out of this cycle, yet I’m not sure how, which frightens me. If I stop this massive production…. How will I know I matter? How will I know I’m valuable? 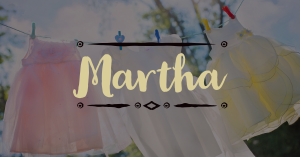 Martha’s story is ours in many ways. Jesus Christ came in person to her home, yet she busied herself, wearing herself out, and causing relational tension between she and her sister. Work was her identity. And for many of us, the same is true. We long for approval, and we work hard to get it, but the secret? His delight dances over us regardless of what we do. 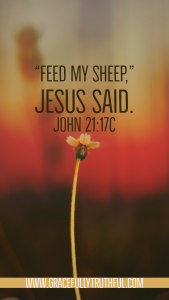 Lean in, Sister, hear His heartfelt reply to Martha, and let His truth sink into your soul. I know why you work so hard. Your insecurity is no surprise. Your incessant work is an ongoing struggle to prove your value to the world…even to Me. To stop working is to risk being unnecessary. If you stop producing, you may not be valued in the eyes of those you seek to please. Why, dear Martha, do you exhaust yourself for the admiration of fickle humanity? Precious Martha, why do you chase the dollar-store baubles of human acceptance when I extend to you my nail-scarred hands overflowing with dazzling gems? I know you’re weary and depleted, Daughter. while I alone am your source of living water. Only one thing is needed, Martha. Everything you seek, you will find in Me, in my Words, in the comfort of My Spirit, and the communion of my fellowship. You are exhausting yourself in search of admiration. When it’s attained, it’s never enough. Never enough; it could be your life’s motto right now. Whatever you do, it is never enough. But Martha, I am enough! I am enough to sustain you and give you the unconditional love you seek. Seek Me, find Me, and experience wholeness, satisfaction, and rest. Rest your troubled head upon my chest and let Me speak affirming truth over you. I love you simply because you are Mine, not because of what you produce. If you never created another thing, I would still love you. Martha, you are safe in my love. You don’t have to earn it, or prove you are worthy of retaining it. You are safe in the shelter of My embrace; I will never let you go. but you must create space for our relationship to grow. Here, we will be knit together by My Spirit as my deep acceptance and boundless love continually stun you. Infused with holy power, I will ignite your work for Me, giving light, warmth, and comfort to many. You said you would go beyond your limits for Me, but I don’t want that. I gave you those limits to protect you and remind you to sit with Me. Martha, you are amazingly strong and capable; you have much to give in My name. It’s not by your ability, your prowess, or your creative multi-tasking that My Kingdom will grow; it’s by My Spirit. As I infuse your diligent hands with My Spirit, you will be energized. As you learn to listen to My Spirit’s whisper, You will find it easier to say “No” to those things outside the limits I’ve given. My beautiful Martha, put down your spatula. Lay aside your apron and come to Me. Drink deeply from the cup of acceptance I place in your hands. Sink into the embrace I offer and simply be with Me.